The Pacific Northwest tree octopus (Octopus paxarbolis) apparently was first sighted in the temperate rain forests of the Olympic Peninsula on the west coast of North America. However, since octopi, or more grammatically proper, octopuses (crediting Maggie Wilson , The Zombies Ate My Brain, for this important research) , are extremely intelligent (“Some evolutionary theorists suppose that ‘arboreal adaptation’ is what laid the groundwork in primates for the evolution of the human mind.”) it appears tree octopuses are acclimating to harsher and milder climes in their quest for survival. 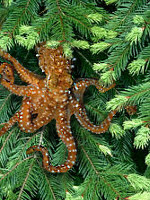 Check out sightings of the ALLEGED tree Octopus here. This entry was posted in "Don't quote me", Creative Expressions, Creatures & Critters, Fun & Frivolity, Prose & Poetry and tagged amphibians, evolution of the human mind, Hood Canal, Jacqui Murray Word Dreams and Ask a Tech Teacher, Maggie Wilson The Zombies Ate My Brain, octopus, Octopus paxarbolis, Pacific Northwest Tree Octopus, solitary cephalopod, temperate rainforest of Olympic Peninsula, Tree Octopus poem, west coast of North America. Bookmark the permalink. Sara! So glad your checked my blog out. It’s always nice to know that my form of self-amusement (blog) is fun for others too. Judy, wanna go on a snipe hunt? Take a flashlight – it’s dark out there. 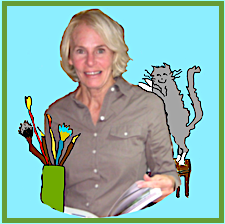 You’ll be fine alone in the wilderness – you aren’t a scaredy cat. I’ll wait for you back at the campfire. I would have taken you up on your offer to go on a snipe hunt UNTIL I heard “heh heh heh”. Now I can’t trust that you’ll wait for me back at the campfire to see all the snipes I’ve collected. Me too. I’ll be the one with the captured tree octopus. Careful–they’re small. Are they tasty? Bring skewers.